A "blizzard bandit" slogged through knee-deep snow to rob five stores at gunpoint in Prince George’s County starting Friday as a huge snowstorm slammed the area. The crime spree started about 8:45 p.m. Friday, hours after the blizzard began dumping snow on the region. The blizzard bandit held three women at gunpoint while demanding money at Perlas Restaurant in Prince George’s County, police said. Flurries of snow concealed a second armed robbery just before midnight Saturday. Surveillance cameras caught the suspect covered in snow up to his knees when he walked into a 7-Eleven on Powder Mill Road. “He used the snow as an accomplice,” News4's Pat Collins said. The blizzard bandit struck a third time at a 7-Eleven on Cherry Hill Road about 4 a.m. Dramatic surveillance footage shows the suspect pulled a gun on employees before he sent them to the back room and took money. The bandit was in and out of the store in just a minute, police said. He fled on foot. “He just walked [away],” said Hunter Carter, who was working at the store during the robbery. With nearly 2 feet of snow on the ground, the blizzard Bandit robbed another 7-Eleven on Garrett Avenue in Beltsville early Sunday morning. 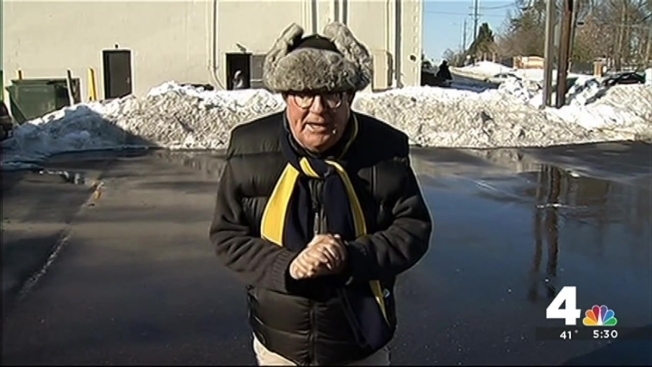 In the next 30 minutes, the Blizzard Bandit traveled 5 miles to stage his final robbery in College Park, Maryland. The blizzard bandit wore a brown mask during the robberies, and police described him as a white man nearly 6-foot-tall and 140 pounds. The blizzard bandit must have disappeared into a puff of white fluff, because police are still searching for him and even offering a $2,500 reward for his capture. “He took advantage of the snow and some of the issues with getting around in the community to prey on the community,” a police officer said.